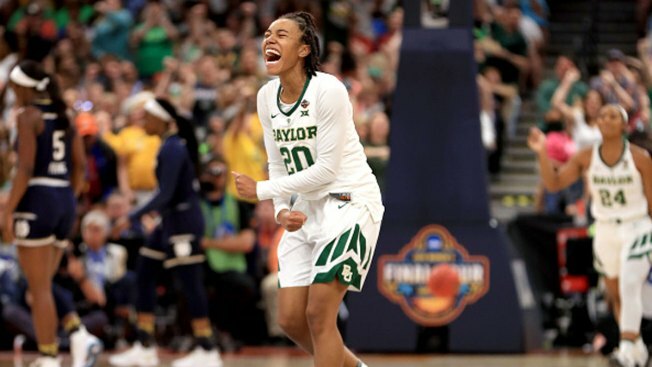 Juicy Landrum, #20 of the Baylor Lady Bears, celebrates the play against the Notre Dame Fighting Irish during the first quarter in the championship game of the 2019 NCAA Women's Final Four at Amalie Arena on April 7, 2019, in Tampa, Florida. Baylor lost a star player, then the rest of its 17-point lead. But the Lady Bears, led by the ever-poised Chloe Jackson, kept their composure. Jackson drove for a tiebreaking layup with 3.9 seconds left, and that put the game into the hands of another tournament hero. Notre Dame's Arike Ogunbowale missed the first of two free throws with 1.9 seconds remaining, and Baylor held on for an 82-81 victory Sunday in the NCAA women's basketball championship game. "They just kept doing what we've been taught to do, and that's guard people," Baylor coach Kim Mulkey said. "We just beat the defending national champions. That team is so good, so talented. You're going to see those guys play at the next level. Wow." Baylor was able to pull off the win without star forward Lauren Cox, who injured her knee in a frightening scene late in the third quarter. The Irish were able to rally from a 14-point deficit in the third quarter to tie it at 78 in the fourth. Jackson then scored a jumper from the foul line, and Jessica Shepard countered with two free throws to tie it, setting up the exciting finish. "We had to do it for LC," said Jackson, who was named the Final Four's Most Outstanding Player. "She got us here. We had to finish the job for her." The Lady Bears (37-1) won their first championship in seven years. Mulkey and Baylor have won titles in 2005, 2012 and 2019. The 2012 championship game also pitted the Lady Bears against Muffet McGraw's Irish in the last meeting of two female coaches for the title. The Lady Bears were primed to run away with the game as Notre Dame struggled to score. But the Irish have a knack for big comebacks, doing it against UConn in this year's semifinal and against Mississippi State in last season's title game, when they rallied from 15 down in the third quarter. Ogunbowale was instrumental in all those victories, forever becoming a part of the Final Four during last year's title run. She made a shot with one second remaining to beat UConn in the semifinals, then hit a tiebreaking 3-pointer with one-tenth of a second left to top the Bulldogs in the title game. Ogunbowale led the charge again Sunday, scoring 17 of her 31 points in the second half. That included a buzzer-beating 3 at the end of the third quarter, sparking an 11-0 Notre Dame run. "It just wasn't meant to be. It's going to be a hard pill to swallow," said Ogunbowale, who finished with 155 points in the tournament — the fourth most all-time. "But things happen. I had a fun, great career here at Notre Dame." It helped the Irish that the Lady Bears had to play the last 11 minutes without Cox. She got tangled up with Kalani Brown on the defensive end and went down clutching her left knee with about a minute to go in the third quarter. The 6-foot-4 junior was crying in agony before they took her off the court in a wheelchair. Her mom was tearing up in the stands, and her dad had his hands over his face. "I'm emotional for a lot of reasons, but mostly for Lauren Cox, and I'm so happy," Mulkey said. "These are tears of joy, but they're also tears of thinking about injuries. "The worst part of the game was Lauren Cox," she added. "We had control of that game from the start to the time she went off the floor. We had to regroup. For us to win was a miracle in itself when you lose a player of that caliber." Cox came back to the bench in the fourth quarter on crutches, with a big brace on her left knee. She was the first one to hold the trophy after the game. "I'm one of the leaders on the team, so just to have my voice there (on the bench) and tell them I'm still OK, they told me they were going to do this for me," Cox said. Mulkey was able to celebrate her third title with her family close by. Daughter Makenzie is on the coaching staff, and infant grandson Kannon Reid was sitting in the front row behind the bench. The trio had a special moment on the ladder as Mulkey cut the final piece of the net. She playfully put the entire net on her grandson's head. With the game tied at 80, Jackson drove with her right hand and hit a layup that bounced off the rim before dropping in. Sunday's game marked the eighth time in the past 20 years that there have been two women head coaches in the title game but only the second time since 2008. The last time was in 2012 with these same coaches. As of 2018, only 59.5 percent of head coaches in Division I women's basketball are female. The victory broke a tie for third all-time between Mulkey and McGraw for career NCAA titles. Mulkey has three, placing her behind Geno Auriemma (11) and Pat Summitt (8). TIP-INS: The Irish remained at 999 victories in school history. McGraw has been the coach for 835 of them. ... The 11-point differential for the three games in the Final Four was the closest in the history of the tournament, topping last season's 15-point margin. STRONG ATTENDANCE: Nearly 275,000 people attended the NCAAs, which ranked eighth all-time, including 20,127 for the title game. It was the highest attendance in over 15 years. "We've had a really great championship. Our first and second round numbers is the best we've seen in 11 years," NCAA vice president for women's basketball Lynn Holzman said. The regionals provided a strong boost. Portland, Oregon, a first-time site, averaged over 11,400 fans and will host again next year. The regional attendance was its highest since the NCAA switched to neutral sites after the 2014 season.